Our new friends in the Bay area have one of the coolest old houses I’ve ever seen. I could spend a full day there exploring and photographing everything. My youngest daughter was especially fond of the “doll house” (play house) built out back by the previous owner for her daughter. It has fully functioning water, A/C and more. Heck, I’d live in that kid’s cottage. 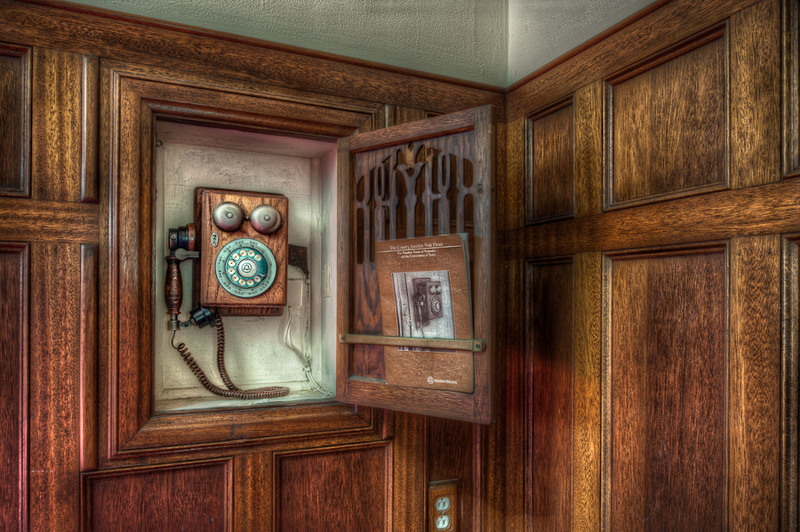 Inside the main house, I just had to grab a shot of this awesome old phone box. Man I love “retro” eye candy! Pat O’Brien – Wow, this is a fantastic find. I love old things like this, and the fact that it has a “faux wall” (or door), built in front of it to hide it so it’s not an eye sore is even cooler! Chris Frailey – Man I love the warmth in that wood. Very well done. Steve Beal – Incredible texture, love your processing style on this one! Luís dos Santos – great one Jacques! Love the tones and the anthropomorphic shape of the phone. It has almost a baroque feeling in it. amazing! Chris Robins – awesome texture in the wood. nice phone too. ring ring ring…. Evelynne – You make it look hopeful and almost romantic. Can not wait to show Jim!